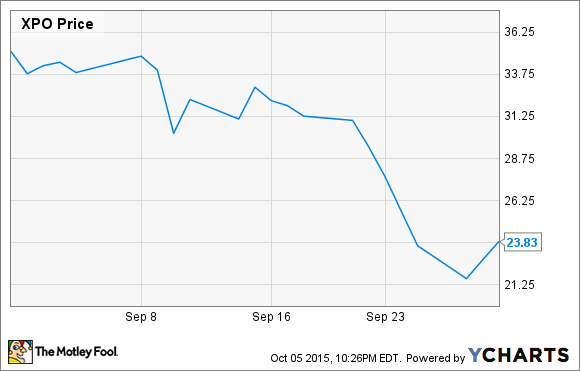 XPO Logistics' shopping trip in September made Wall Street uneasy. Shares of XPO Logistics (NYSE:XPO), a transportation and logistics company that provides truckload, air, and water transportation services, tumbled by 32% in September according to data from S&P Capital IQ, following the company's announcement on Sept. 9 that it was purchasing trucking company Con-way (UNKNOWN:CNW.DL). Under the terms of the deal, XPO agreed to pay roughly $3 billion for Con-way, including around $290 million in debt. Based on the press release, XPO will pay $47.60 per share in cash for Con-way, or about 5.7 times the consensus EBITDA for 2015. Expected to close in October, the deal nearly doubles XPO's pro forma full-year EBITDA and adds about $15 billion in revenue per year. XPO also announced that it believes it can improve Con-way's operations and boost its operating profit by $170 million to $210 million within the next two years. Wall Street and investors, however, are skeptical of XPO's aggressive acquisition. Keep in mind that XPO also completed a deal earlier this year for Norbert, a European trucking firm. XPO's acquisition-first strategy is definitely packing on the revenue, with sales expected to grow from $2.4 billion in 2014 to $18.4 billion by 2018 (and that's before Con-way is factored in). However, it's also piling on the debt, with the company already sporting $3.8 billion in debt in its most recent quarter. The real question that investors should be asking here is whether the fears that led to XPO's 32% tumble in September are overblown, or if concerns are justified. The way I view it, there are two concerns worth monitoring here. The first, as mentioned above, is XPO's balance sheet. As it stands now, it doesn't appear that XPO's debt is unmanageable. However, if acquisitions remain XPO's primary source of growth, then its debt levels could rise and become troublesome. The other concern is whether XPO's management team is losing sight of its business focus. XPO has always been more of a supply chain management company rather than the operator of logistics assets itself. However, in recent months it's been buying those transport assets, leaving some investors to wonder what management is thinking. Personally, I do believe the sell-off in recent weeks could be a bit overdone considering the growth prospects that are now on the table, although I also fully understand the skeptics' case here with regard to XPO integrating its new businesses. I suspect investors who take a long-term and patient approach will likely be rewarded, but there could certainly be some bumps in the road along the way.